Every day is the day that turns somebody’s life around forever. By the end of this email, you’ll know the answer. One evening, not many years ago, a young housewife realized she didn't have enough cash on hand to buy some of the groceries she needed for the rest of the week. As a stay-at-home mother and wife, she was entirely dependent upon her husband for income. So, when he arrived home from work that evening, she asked him for an extra 10 dollars. Hearing the question, he turned to her with visible irritation. He heaved a sigh, rolled his eyes, and tauntingly sneered, "What for?" She was stung by the contempt in his voice, and by the humiliation she felt at having to grovel for a measly 10 dollars. And in that instant, she made a decision: She would never ask another person for money, ever again. Today, this same young woman is the vice president of a prestigious company, pulling down a hefty six-figure salary, with a string of promotions behind her and many more sure to come. Indeed, she has never asked anyone else for money since that fateful day. And she never will. In hindsight, it's easy to recognize just where, when, and how a success story started. your unrealized goals, dreams, and wishes? We're all looking for a transformation in some area of our lives. It could be something as simple as shedding a few extra pounds. Or as significant as finding a whole new career path. No matter how big or small your current dreams may be, if they're ever going to become a reality, it will be because of one critical day in your life's journey. The day when you hear the idea, experience the episode, or are hit with the realization that somehow, mysteriously, makes all the difference in the world. The day when you finally get that elusive "missing piece" you've been waiting for — the thing that suddenly empowers you to actually do the thing you've only dreamed of doing up until now. The day when you take a seemingly insignificant step that winds up setting you on a completely new path ... and ultimately leads you to your goal. Just one day. That's all it takes to turn any "what if?" — what if I were richer, happier, thinner, healthier, more successful, more organized — into what IS. The question is, When will that day arrive? Leave it to chance, and it could come next week, or never at all. Worse, it could come and go without your ever picking up on the signs or seizing the opportunity that it brings your way. But here's the good news: You don't have to wait for it to show up! The Day That Turns Your Life Around is a groundbreaking program by the world-renowned master of motivation Jim Rohn that delivers that magical, transformational moment right to your doorstep and then shows you how to follow it all the way through to extraordinary achievement. No one knew better than the legendary Jim Rohn what an incredible difference one day can make in the trajectory of a life. His own life-changing day arrived nearly 40 years ago, when a Girl Scout rang his doorbell, selling cookies for two dollars a box. At the time, Jim didn't have two dollars — not in his pocket, not in his bank account, not anywhere. He was flat broke, and so ashamed of it that he lied to the girl, telling her he'd already bought a few boxes from someone else. As he closed the door, his shame intensified. Here he was, a grown man with a family living in the Land of Opportunity, so broke he didn't have two dollars to give to a good cause, and so pathetic that he'd actually lied to a Girl Scout! "That's it," he thought to himself. "I'm not living like this anymore." Many years, millions of dollars, a hugely successful business enterprise, and millions of devoted students later, Jim thought back through the course of his life and realized that all of the success he had experienced up to that point had begun at that precise moment, so many years before. But what was it about that particular day? He'd been broke before that. He'd been driven to desperation before that. He'd even resolved to change things before that. It took some time. But he finally figured out what it was that made that particular episode — that one specific day — so different from any other. Why it was able to galvanize and transform him in a way nothing else had. When he did, he realized something even more amazing. What he had experienced unexpectedly was something that anyone could experience deliberately, by choice. From then on, showing people exactly how to do that became a part of Jim's personal and professional mission. That mission has culminated in The Day That Turns Your Life Around , an incredible mix of high-octane live presentations and intimate studio sessions in which Jim tackles topics and reveals insights he has never touched on anywhere before — revealing the essential elements of a life-changing day, and showing you how to consciously create the conditions that make lasting personal transformation not merely possible, but inevitable. YES, I want to turn my life around starting TODAY! Jim's analysis of his own transformational day and those of other people he knew revealed something interesting: For change to happen, several distinct emotions need to be present. You've probably been familiar with each of these emotions at one time or another. On their own, they will only take you so far. But when all of them are combined in just the right way and experienced in just the right sequence, change is the guaranteed, unstoppable result. In The Day That Turns Your Life Around , you will discover what these emotional states are and how to generate them within yourself at will, rather than waiting for external circumstances to activate them (something which may never happen). Once you've put yourself in the ideal emotional state, Jim will show you how to direct that momentum toward the specific circumstances of your life that you want to change. Jim Rohn ... Like you've never heard him before! Jim Rohn is a certified legend in the field of personal development. He's the man the mentors themselves look to as their own source of inspiration and insight. The Day That Turns Your Life Around is the program that the legions of Jim's fans around the world have been waiting for. It marks a totally new and incredibly exciting direction in the work of this master motivator and philosopher. Here, Jim steps off the stage and into the intimate surroundings of a studio for an extremely rare conversational presentation of ideas and strategies he's covering for the first time anywhere! You'll feel as if Jim is right in the same room, speaking directly to you in a one-on-one coaching session focused on your unique goals, needs, and challenges. These powerful one-on-one sessions are interspersed with material recorded LIVE at one of Jim's famed mastermind seminars. Anyone who has ever heard Jim Rohn speak or experienced one of his presentations in person knows what an unbelievable speaker he is. His intensity and energy are contagious. They leave people feeling ready to take on the world and win — and thousands of them end up doing exactly that! This combination of live and studio recordings has resulted in an amazing listening experience that will instantly catapult you to a whole new level of focus, certainty, and determination. But even more importantly, this breakthrough program will equip you with the specific tools you need to seize any day and make it the one that makes all the difference in whatever it is you want to achieve in your life — today, tomorrow, and for years to come. P.S. Years from now, will you have forgotten all about today, the day you received this email? Or will you look back on it as the day that ultimately transformed everything for you? You won't know unless you order The Day That Turns Your Life Around , and hear it for yourself. YES, I discover the incredible difference one day can make!! 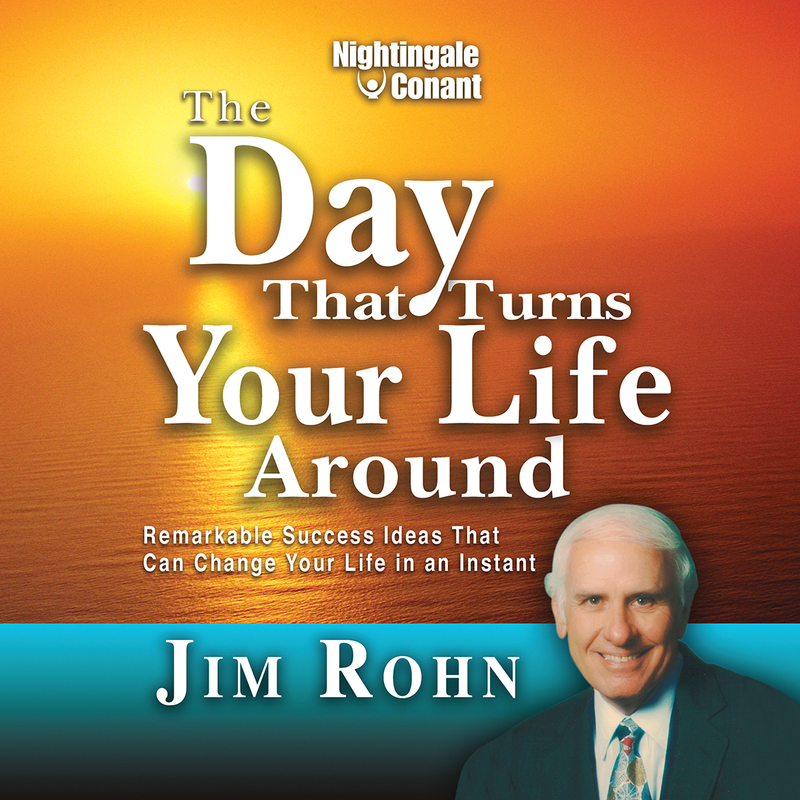 Please send me Jim Rohn's bestselling audio program The Day That Turns Your Life Around at the special price below. - I can select one of two ways of ordering.